… is Chalicea fond of an alcoholic tipple or two? There was a reference to limiting its supply in the desert (very wise) and trying to get some food (yeah, right) from the taproom, but it looked as though she was trying to convince us she was not fond of a G&T or glass of Malbec. Trying just a bit too hard I feel! Having unclued thematic entries at 1 and A across was a bit annoying, so I tried my luck with the downs. 1 could have stumped me if I hadn’t thought of ACTS straight away (RE[D]ACTS – RE), and 2 brought back memories of schoolboy French with that lovely word for armchair, FAUTEUILS. I was up and away… -ish. This was by no means the usual stroll in the park from Chalicea with some devious definitions and tricky wordplay. 13ac, for example had Horrible true story, axing a rook, one that hunts marine reptiles (7) giving tru[E]* + TALE – A + R for TURTLER; and 17 My people abandoning regal ceremony (3) was CO[R]ONATION – NATION, although I’m not sure I’m a fan of taking away more than you’re left with! After about 30 minutes, I had the top row looking as though it might be FASHION GUILD. Two minutes later, with RATION finally being slotted in, it was obviously A FOREIGN FIELD and we were in WWI territory again with Rupert Brooke’s The Soldier. Only time would tell how this poem would manifest itself in the extra letters or what three things would need highlighting in the final grid, so I soldiered on with little additional help. 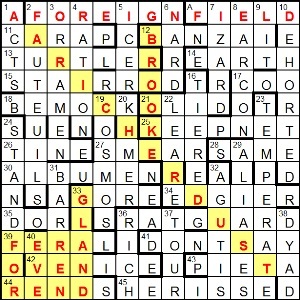 I do enjoy a puzzle where I start at the top, drop down the right hand side, along the bottom and finishing with the left. It is particularly helpful if I manage to solve all the clues along the way! 21ac Humming Great Balls of Fire endlessly (4) obviously made me chuckle, being BOLID[E]S (a large meteor or fireball) without its ends, and I loved the definition in 36ac With Rear Admiral cunningly drag out ship’s Health & Safety precaution in port (8) leading to RAT-GUARD (RA + DRAG[O]UT*). However, I’m not really sure that the E-VE[T] at 40dn would be much help! Eventually, the extra wordplay letters gave The corner. What is concealed in thirty-six fourteen. Poet, 36 14 being RICH EARTH. 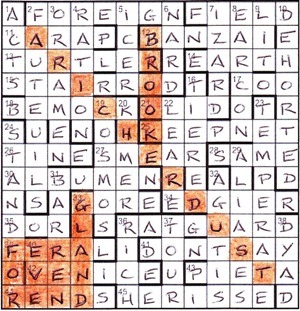 It didn’t take too long to discover FOREVER ENGLAND in the bottom left corner, A RICHER DUST in the leading NW–SE diagonal, and BROOKE himself in column 7. As for the title: Rupert Bear, Brook (=Bear), e (Bearing). He died 100 years ago on 23 April as a result of one of the great killers of the 20th century… the mosquito. Thanks to Chalicea, as always, for an enjoyable puzzle, remembering one of the great poets and poems of English Literature. This entry was posted on 15 May 2015 at 4:00 pm	and is filed under Solving Blogs. You can follow any responses to this entry through the RSS 2.0 feed. You can leave a response, or trackback from your own site.